What’s the password for the Arceus doll? >We’re giving away another awesome Pokémon Doll Décor item for your Pokémon Dream World home! In January, you can get an Arceus Doll. Look in your Pokémon Trainer Club Mailbox for a password that will unlock this Décor item at the Pokémon Global Link. Look at the mailbox for the password. oh I never new about this! Does anyone have the password for the Pikachu doll on the Global Link Dream World? 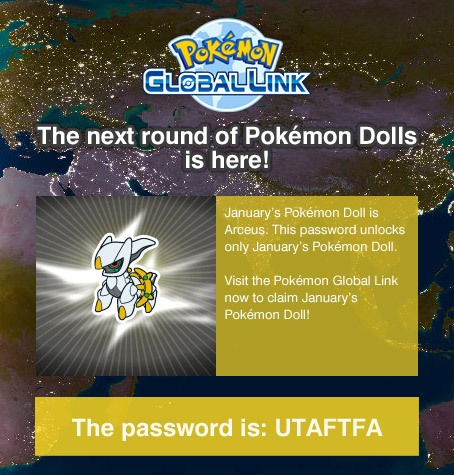 What is the Password for the Reshiram, Zekrom, and Keldeo doll on PGL? Do we need a password for getting arceus in the global link or is it freely given? Whats the password for the "Carnival Pokemon" musical? What is the password for getting lucario in global link? What is the password for the ''Winter Decor'' on PGL? What is the PGL Mamoswine Password?